With the big 32 coming up for Kim Kardashian on Sunday, Kanye West must’ve known he had to pull out all the stops for her birthday weekend. 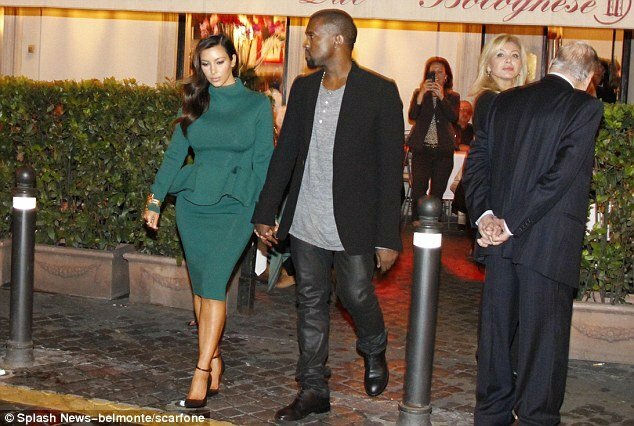 Kanye West, 35, whisked Kim Kardashian out to a romantic restaurant in Rome on Thursday night to kickstart the festivities. And she looked delighted with the choice of Il Bolognese in the H’Errys Nar in Via Veneto. The restaurant is, like it says on the tin, famous for its bolognese pasta. The trip Europe is well-timed break from travails in Miami, where Kim Kardashian is currently residing. The reality star has been in the Sunshine State with sisters Kourtney and Khloe as the ladies film the latest season of their spin-off show, Kourtney & Kim Take Miami. The show chronicles their attempts to set up a new branch of their clothing store Dash and the trio have been seen scouting locations.